Click here to view the MSN Chat transcript. Josh Groban wins an Award! 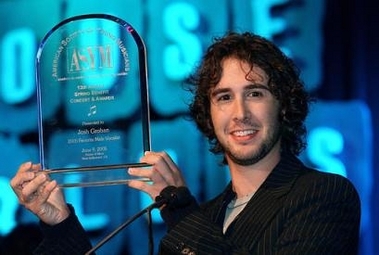 Josh Groban holds up his award for Favorite Male Vocalist at the American Society of Young Musicians Benefit Concert & Awards Show, Thursday, June 9, 2005, in West Hollywood, Calif. Here is the information about the episode. About: American Dad: (DAD-107) "Deacon Stan Jesus Man"
When Stan hears his rival Chris White wants to become the new deacon of their church, Stan decides he wants the position as well. Unfortunately for his family, Stan's competitive nature gets the best of him as he tries to win the deacon race. Meanwhile, Steve takes a class at the church with Betsy, the Whites' daughter, who's a Gold Medal gymnast. Steve does back flips for her and their romance helps bring Stan to his senses. Josh Groban's song "Beleive", from the Polar Express is nominated for an Academy Award for Best Original Song in a Motion Picture. The Awards show was on Feburary 27th, 2005. On 10-25-04 there will be an hour long show about the movie The Polar Express. Josh will be on the show to sing his song "Believe" from movie and the soundtrack. The soundtrack will be released Nov. 2nd and the movie will be released Nov. 10th.